I’ve already written about flânerie, or aimless wandering in Paris, in this post. And I’ve done lots of wandering around Paris, but I’d never been to an exhibit dedicated entirely to this very Parisian pastime. 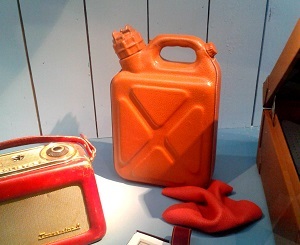 At the end of September, an Hermès exhibit, Dans l’oeil du flâneur, or “In the eye of the wanderer,” was set up in a temporary space along the Seine River. 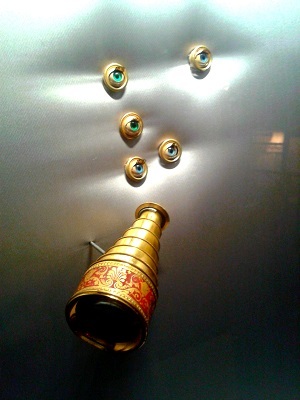 The exhibit featured room after room of Hermès objects, like walking sticks and canes, bags, and even a collection of lorgnettes, or spyglasses, from Emile Hermès’ own collection. Everything was displayed in a playful way – a little like Alice in Wonderland meets haute couture. 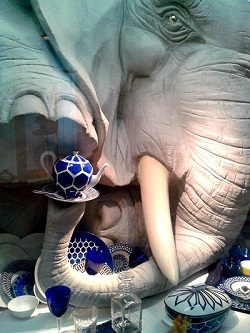 Dishes under an elephant’s watchful eye and even a leather-covered gas can were all on view to the curious wanderer. But when I think of Hermès, I think not of gorgeous scarves and saddles, but of my friend Yohan. Now at Chloé, he worked for many years at Hermès as a pattern-maker and cutter, and has toiled had the honor of designing in many other illustrious Parisian fashion houses. Yohan is intarissable on the subject: he can’t keep quiet about his workplace. He loves to talk about the flamboyant personality of this or that designer, or the overtime he puts in during different seasons’ runways shows, working alongside all the other petites mains, or little hands, in the industry. One evening over drinks here in the 20th, Yohan told me he’d been working for Chloé for a year or so now. He explained that Chloé isn’t a haute couture maison, or design house, but rather prêt à porter de luxe, or luxury ready-to-wear. Then he proceeded to enumerate the differences between the two. Who knew, for example, that haute couture uses special cotton or even silk thread? (The price? About 6€ a spool – prêt à porter uses polyester thread.) And the finish isn’t the same: in haute couture, they use a technique which is called a bourdon or traditional satin stitch, because it’s more flexible, and according to Yohan, results in more beautiful curves. And couldn’t we all use more beautiful curves? But only a few houses still produce haute couture, or custom-made pieces. The production costs alone are between 15 and 20,000€ for a dress that will be sold for about 45,000€. If that seems excessive, there are about 2 months’ work, or 300 hours, involved in fabricating the piece: to say it’s heavily labor-intensive isn’t exaggerating! When Yohan isn’t talking about his life’s work and passion, he talks about his other favorite subject: food. Last time we met, we somehow got on the topic of travel first – he’d just come back from a vacation on Belle-Ile-en-Mer, an island off the south coast of Brittany. And then like most French conversations, we got back onto the subject of food. Yohan told me about a magical dessert he’d had on Belle-Ile as a child. With a faraway look in his eyes, he described a hybrid dessert called the Palenten, somewhere between a clafoutis and a deliciously caramelized Tarte Tatin. You’ll find my answer – in the form of a recipe – to his search below. This dessert is dense and fruity, drizzled with salted caramel, and perfect after a long day of aimless wandering, or flânerie, wherever you happen to be. A Breton flan, or far in the local language, is usually made with prunes, so I’ll expect some disgruntled Breton friends to contact me following the publication of this non-traditional recipe. Then again, last time I brought this dessert to a party, the dish was scraped clean! 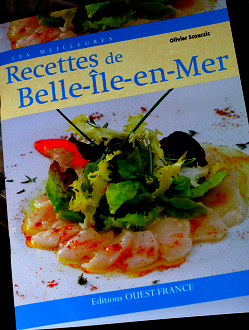 The custard recipe comes from a book called Les meilleures recettes de Belle-Ile-en-Mer by Olivier Scourzic. 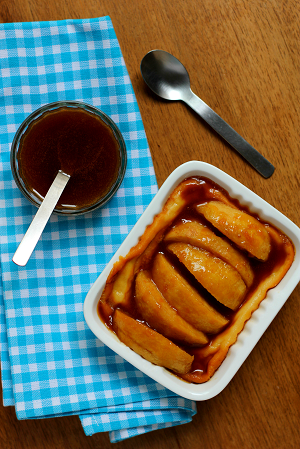 Either way, with prunes or with delicious caramelized apples, this custard is very dense. It’s just made for hungry folks who have been braving the windy, rainy Breton weather – or for that matter, the slightly less windy and rainy Parisian autumn. And I’m sure my Breton friends will forgive the substitution since this is made with the traditional butter of Brittany: demi-sel or salted butter. Délicieux! 1. Preheat the oven to 400°F (205°C). Generously butter the baking dish with the salted butter. 2. In a large bowl, combine the flour and sugar and whisk together to combine. Make a well (or hole) in the center and add the eggs. Begin whisking, and little by little, incorporate the flour into the middle while also adding the milk into the center. Whisk well so that there are no lumps, add the vanilla extract, and stir again. 3. While this mixture rests at room temperature, peel and seed the apples, while rubbing them with the half-lemon so the apples won’t turn brown. Cut each apple into 8 pieces lengthwise. 4. To make the caramel, combine the sugar and water in a small saucepan and heat over medium-high. The mixture will bubble as it cooks. Just swirl the pan around on the burner – no utensils necessary! 5. When the caramel begins to brown, stay close and keep swirling – you may lower the heat to medium at this point. When it turns a nice dark brown color and smells like caramel, remove from heat and add the butter all at once, whisking to blend. 6. Return to medium heat and add the apples to the caramel. Cook the apples in the salted-butter caramel for about 3 minutes, stirring frequently. 7. Remove the saucepan from the heat and let it sit for about 3 minutes. Then, using a slotted spoon, transfer the apples to the buttered baking dish, scattering them around the dish. Then pour in the custard mix – it’s fine if the apples float up into the custard; you can gently push them around to distribute them evenly. 8. Carefully place the dish in the oven and bake for 20 minutes. Then turn the oven down to 350°F (180°C) and continue cooking for 20-30 minutes longer. The flan is cooked when it is no longer jiggly in the middle and a knife poked into it comes out clean. 9. Remove from the oven and let the flan cool for about 20-30 minutes. Serve this at room temperature or a little warm, but not hot. Bon app’!